LOUISVILLE, Ky. — Repeat national champion Virginia Wesleyan University won six more games this past week to improve to 78-3 over its last 81, and Christopher Newport moved up to No. 2 in the latest NFCA Division III Top 25. The (15-0) Marlins, who have now outscored their opponents 104-11 this season, completed a 10-0 homestand with twinbill sweeps of Averett, Randolph and nationally-ranked Salisbury to remain the unanimous choice at No. 1 for a 25th straight poll. Meanwhile, Christopher Newport (15-1) used its own 6-0 week — which included a sweep of nationally-ranked Lynchburg — to surge five more places up the rankings. Since losing their opener, 5-4, to Emory and Henry on Feb. 10, the Captains have reeled off 15 straight victories. All eyes will be on Tom and Betty Broyles Field at TowneBank Park this Sunday, when Virginia Wesleyan hosts non-conference rival Christopher Newport for a matchup of the top two teams in Division III. St. Thomas (6-0), which hasn’t played since March 3, but remains undefeated, also jumped ahead of last year’s national runner-up Illinois Wesleyan (6-1), whose only stumble this season has been Saturday’s 3-2 loss to Calvin. With that win, the (6-1) Knights, who had already been receiving votes, moved into Top 25 at No. 18. Massachusetts Institute of Technology, which finally opens its season today at Simmons after being one of the eight teams to advance to the NCAA Championship in Oklahoma City last season, remains fifth, while East Texas Baptist (20-1) completes an unanimous top six, despite suffering its first loss of the season on Saturday in the second game of a road doubleheader against new No. 19 Texas Lutheran. Elsewhere, No. 13 Kean (14-1) gained five places after collecting its 10th straight win, while No. 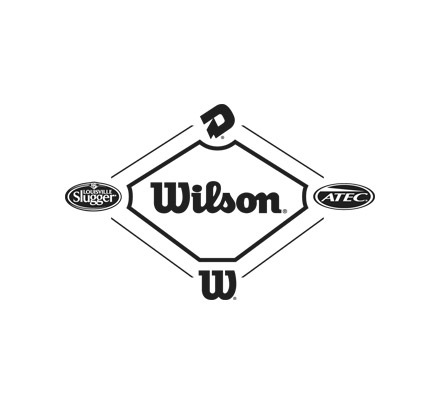 22 Rensselaer Polytechnic Institute (11-2) and poll newcomer Millikin (10-2) at No. 23 have both won nine straight. Others on a roll are Muskingum (eight straight), Nebraska Wesleyan (six straight) and Whitworth (15 in a row after starting 1-3). 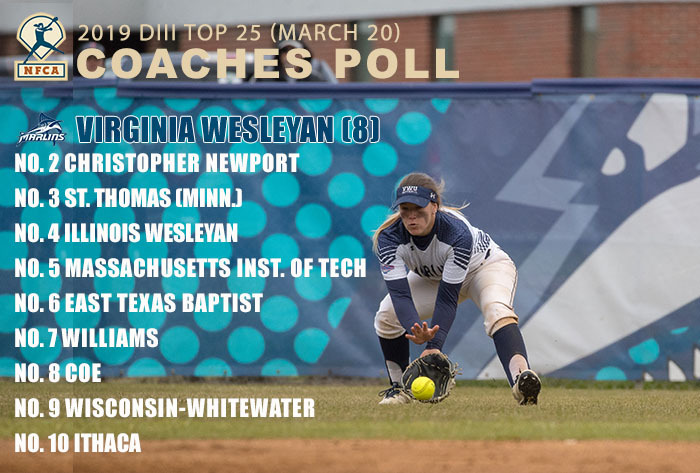 The NFCA Division III Top 25 Poll is selected by eight NCAA Division III head coaches representing the eight NCAA regions. Current 2019 records are listed, with first-place votes in parentheses. Others receiving votes: Muskingum 8, Tufts 8, Geneseo 6, Saint Benedict (Minn.) 6, Amherst 5, Wisconsin-Stout 4, Luther 3, Nebraska Wesleyan 3, Pacific 2, Trine 2, and Whitworth 2. Dropped out: Birmingham-Southern, Central (Iowa), Transylvania and Wartburg. * NOTE: Texas-Tyler is reclassifying to NCAA Division II, and Pfeiffer continues the process of going from Division II to Division III. Neither is eligible for the NCAA Division III Championship.